Traditional wisdom is that fishing poppers and other surface lures is best done early morning, late afternoon, at night and when the skies are cloudy. Additionally, that the best time is when the water is warm, that is between 60-80 degrees. Why? Because generally speaking top water lures are most attractive to active bass. Though not viewed as the best season for topwaters, spring, before spawn, finds bass patrolling flats where water is shallower and there is abundant cover. Water here warms faster and they take advantage of this to crank up their metabolism. Stump fields on flats should be viewed as potential bass magnets and fishing poppers among them can produce some great fishing days. These low-light times are particularly good for fishing poppers in the summer months. Contrary to popular belief, in clear water bass will regularly meander from deep water into the shallow water of creeks where the oxygen levels are higher and various baitfish are active. Fall is recognized as the primo time for topwater fishing. Bass move into the feeder creeks in pursuit of shad. Fishing larger size poppers can reward anglers with some of their largest bass. Flats also attract bass during low-light periods where they seek forage such as sunfish and shad. Crawfish are also to be found here because the nocturnal nature of results in their activity increasing during low light periods. Take note. Since the venerable Pop-R was introduced many variations have been created, and though they may look basically the same and appear to fish identically, they all perform differently. So don’t limit yourself to just one design or brand because the inexplicable preferences of bass on any given day may send them to strike one over another. What follows are the various factors that can determine your success or lack thereof when fishing poppers. Common opinion is that optimum temperature for topwater fishing is, by most standards, 62 degrees. Having said that, reality is that largemouth and smallmouth bass can be caught with a topwater lure just about any time. But at 62 degrees bass are more inclined to strike topwater lures. Here in Tennessee I and many of my Bass Bum buddies fish top water lures almost year round with varying degrees of success, though as pointed out the traditional wisdom is that 62 degree water is prime. Generally speaking, water between 60-80 degrees is good for chunking a surface lure like a popper or other topwater fishing plugs for that matter. So, as winter begins to melt into spring and water begins to warm into the 50’s bass that have been hanging out in deep water, usually in the mouths of large feeder creeks, start to move toward spawning areas in those creeks. This early spring, pre-spawn period is excellent for topwater minnow baits. 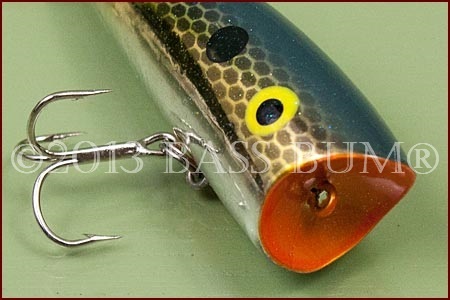 But when the water gets into the 60’s, bring out the nosier, more annoying (to the bass) popper lures. If the water you’re fishing is clear, like that often found in highland reservoirs and natural lakes in northern climes, and calm water to boot, choose top water poppers that are either clear or a natural color. You want the lure to blend with the surface so that the bass, especially smallmouth, don’t get a clear look at it. 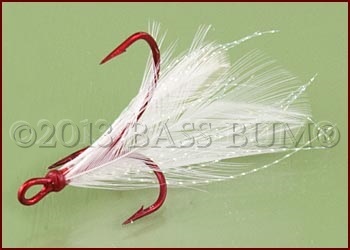 A silver or chrome bottom is also a good choice as it represents baitfish like shad and alewives. If confronted with stained or even muddy water when fishing poppers, choose a popper with brighter color. The initial attractant when the water is very brown or stained is the sound the popper creates, not the lure color. But once the bass focuses on the location of the sound brighter colors, like chartreuse, orange or even black will present a better silhouette and assist in the lure being struck. Should you have repeated short strikes and aren’t hooking up it is likely an indication that the color popper your using isn’t on the mark and a different color choice might be better. Poppers, though great for fishing broad, open expanses of shallow water like flats, are ideal for fishing close to cover, especially any that is only partially submerged like the laydown in the picture. Make long casts to laydowns, grass, stumps and bushes and land the lure as softly as possible right next to it, not past it. Bass that hit top water fishing lures are usually shallow and suckers for Pop-R style poppers. Keeping your distance and long casting helps not spook shallow bass feeding topwater. In fact, even non-aggressive bass “resting” in or close to cover, like under a dock, can be aggravated enough from repeated casts to strike. They’re either stimulated to feed or just pissed off from having a lure stuck in their face over and over again. Traditionally, fishing poppers is thought of as a shallow water technique used around cover submerged or partially submerged. 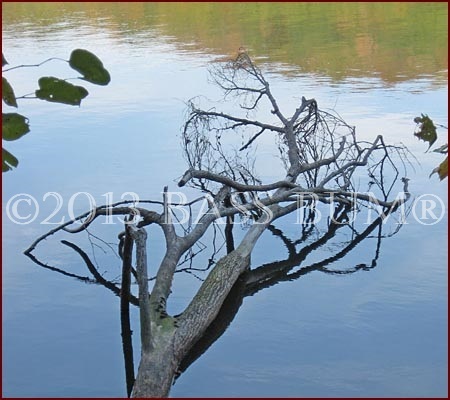 This is certainly accurate in reservoirs where there is usually deeper water close by. Bass, big bass, periodically move from deep water to shallow water as feeding opportunities arise around shallow weeds and wood. However, bass that are 10-15 feet deep along highland reservoir bluffs, especially smallmouth bass, can also be called up by a popper. The concave face of a popper lure is its trademark feature. The cupped face of the lure, when properly worked with a pop and pause, creates the slurp, glub, glop commotion and noises that attract bass. The cadence is the key when fishing top water poppers. In cooler water, characteristic of spring and fall, a popper should be worked with deliberate slowness. A common mistake among anglers is routinely working it too fast. Always allow the lure to sit after jerking or pulling it. Wait until the water rings created subside. The duration you allow it to sit between pulls should be longer in cool water than in warm water. Hard, loud pop-and-pause cadence is great for enticing smallmouth from cover in the dog days of summer. Experiment with cadence till the bass tell you what they prefer. I’ll give it a one-two-three-stop or maybe a one-stop-two-stop for largemouth bass for example. If there are baitfish on the surface and bass are feeding on them I’ll speed it up; pop-pop-pop-pop- pop, stop. Don’t give them a chance to look at the lure. Almost every time strikes occur when the lure is at rest or on the first pop after resting. The presence of a feather dressed rear treble hook that moves slowly with the motion of the water sends bass the signal that whatever it is it’s alive. My preference is a spinning reel and rod, medium action, with 8lb-10lb monofilament or fluorocarbon line.